We have been in at least four hours of worship today. Each worship service – both the one at church this morning at 8am and then the Acres of Hope service this evening – lasted two hours. And each time, the people were completely engaged. Dancing. Singing. Listening. Why the stark contrast between worship in Uganda and worship in Lake Norman, NC.? For many of us at home – we are willing to do the “one and done” method with worship at an average of once or twice a month.What is the difference? Here – there is an absolute dependence on their faith. For us – we depend on a lot of things. And our connection with a community of faith is just one component in VERY complicated lives. Today in worship, Pastor Geoffrey read from the book of Ephesians. I had carried my Bible with me to worship so as I sat next to Charles, a gentleman from Uganda, we shared holding and reading from the Bible as Pastor Geoffrey read aloud. After the passage was finished, Charles didn’t move. So I didn’t either. He sat holding his half, so I continued to hold mine. After a few minutes, my arm got tired. So I propped it up on the chair . . . Charles never moved. Several more minutes passed, Pastor Geoffrey was already deeply engaged with explaining the passage, yet we were stilllllllll there holding the Bible. Several times during the service I would glance in Charles’ direction – really actually fascinated by the fact that he was still holding the book in place. Most of the time his eyes were on Geoffrey; however, there were a few more times I could tell he was reading the words on the page. As the service ended, he handed it to me and thanked me for its use. I asked him if he had a Bible and he said no. I offered him mine, thinking sadly that there was a good chance he will read this more than I do. He had a hunger for his faith. More often than not, I take mine for granted. We discussed that tonight as a team, trying to figure out what we could do to go home and be hungry for God and our faith. We live in such a driven society with so many distractions – it is difficult to make faith a priority. Or at least – we say it is. That was our conclusion. “That seemingly harmless mind-set of “I’m not sure” and “Should I?” is just enough at the critical pivot point to swing our commitment back in the opposite direction. We go in the opposite direction because we know we can return our emotional energy expenditure to normal if we go back to where we come from instead of moving on to something new. Our vow as a team is to return and be changed . . . even if the lasting change is a small one. Little things add up to make a big difference. Look at how this vision of Acres of Hope caught on five years ago! 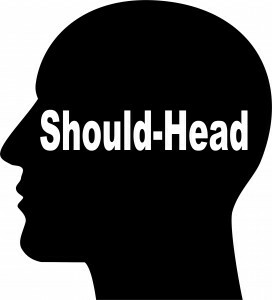 What if we all – all that read this blog – vow to NOT become a “should-head?” What kind of better place would this world be?